Captains practice will start after July 4th holiday and culminate w/ many dawgs going to the Hawk Harrier XC camp in August. "the will to train to win must be greater the will to win"
On a spectacular day this past Saturday, the Dawgs made history. They narrowly defeated Highland 50-56 to capture the South Jersey Group 2 sectional. In doing so they broke a state record of 31 Sectional titles by a program. Going into Saturday, the Dawgs were tied with Bernards who had won 30 sectional titles. There might have been closer titles over the years, but not with in the last 10 years. The Dawgs showed tremendous courage and heart as the top two Dawgs were not 100%. 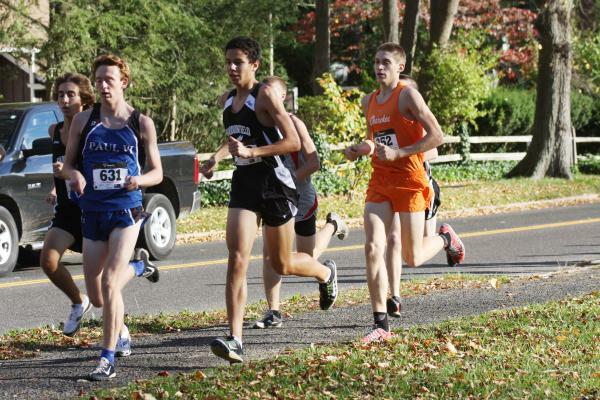 Junior Rob Spaeth stepped up in a big way by finishing 15th overall and 9 places better than Highland's 5th man. 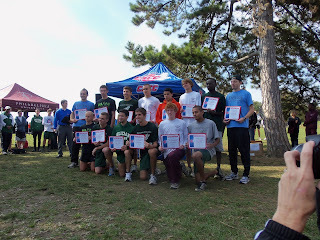 Only two of the seven that raced on Saturday had ever run in a sectional final. Junior Greg Halla & Sophmore Alex Gigliotti. 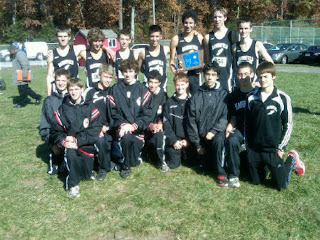 They were racing against a Highland team that was dropping down from Group 3, and made up of mostly seniors. Highland is also coached by one of South Jersey better coaches in Bobby Wagner. To win was a remarkable accomplishment. Congrats!! The girls dominated on Saturday by putting 5 runners in the top 10. Led by the best one- two punch in the State, Meghan Malloy & Shelby Cain, the lady Dawgs easily won 24-90. This Saturday also marked the Varsity debut of Junior Juliette Strasser. Juliette placed 18th overall. Dr. Perry - Superintendent of Haddonfield Schools. Mr. Michael Wilson - Principal of HMHS. Mr. Lefty Banos - Athletic Director of HMHS. The support from the administration is second to none compared to other programs. Thank you for making the effort to support the boys & girls XC teams this past Saturday. The State group meet Saturday 12th. Jim Lambert of the Star Ledger "The best day of the year is this Saturday. The Group 2 race is going to be crazy! Could be the best race of the day" Jim, I couldn't agree more. Look for my state preview later this week. ﻿﻿ With conference and league titles having ended last week we now enter what coaches call the “Championship” season. 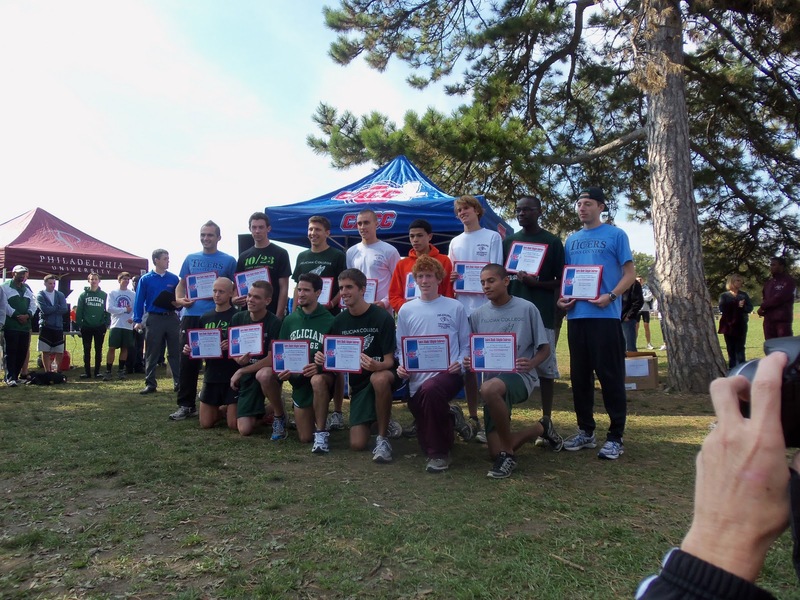 The first leg of the XC Triple Crown starts this Saturday @ Delsea high school with the South Jersey Sectionals. Winning states is ultimately almost every teams goal. The dream starts when spring tracks ends and the hot summer of base building begins. The dedication of logging endless miles, running twice a day and attending XC camp is all necessary to help fulfill their team and individual dreams, in November, by winning a state championship. Well, it all gets under way this Saturday. So how does it all work you ask? qualify for the State Group Championships." The Dawgs have won 14 of the last 15 sectional title according to there teams web site. They missed out in 2003. They have 30 sectional titles dating back to 1967. Make 2011 number 31! Jim Lambert of the Newark Star Ledger reports, "If the Dawgs win the sectional title they will break the state record currently held by Bernards." 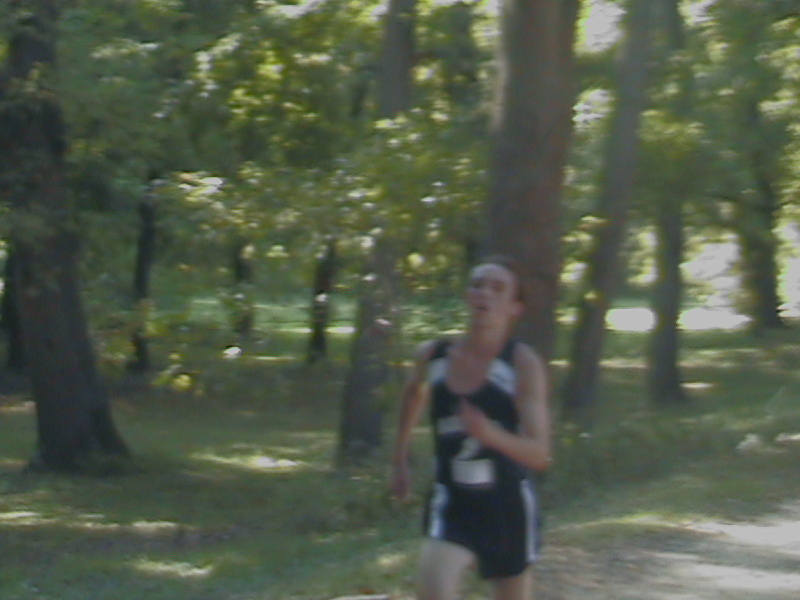 According to NJ Runners, Boo Vitez, in 2009 set the course record at Delsea with a time of 15:24. Boo's time is the fastest ever run at Delsea for all groups. Ben Potts ran 15:55 last year to win Group 2. Other teams that could advance to next weeks group state championship are; Highland Regional, West Deptford, Barnegat, & Plesantville. The Course is flat and fast with a finish on the track. Link below is a map of the course. The Varsity Boys had an off week from racing, as they prepare to head into the championship part of the season. I caught up with Sophomore John Greenberg and asked him a couple of questions about the season etc. John recently ran a huge pr at pennypacker. He dropped 2:39 from last years time on the same course. His mile pr from spring track is 4:56. John shared some thoughts about his breakout season. Tim Malloy: What did you do differently this year between freshman year to sophomore year? John Greenberg: "Coming into my Freshman year I did no summer training whats so ever. Heading into this summer I was sure to train really hard. I had some good mentors to run with this past summer like Ben, Matt & Timmy. They pushed the pace which I think really help me out. As the summer went on I got stronger which has really help me race this season"
TM: Did the coaches give you a plan on how to train this summer? JG: At the end of track season we had a meeting about XC and we were given a summer calender, but I really wanted to step it up and I felt confident that I could step it up. The days I felt good I tried to run as many miles as I could. TM :What do you like best about XC? JG: Nothing is better than getting a PR. 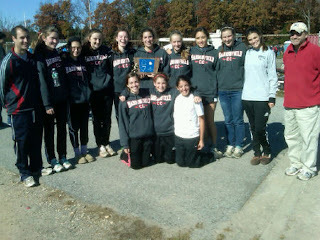 I also like helping the team win a big meet like in NY when we won the NYC XC carnival. TM: Talk about what its been like following in the foot steps of some of the great XC teams Haddonfield has had in the past. JG: We definitely felt it (pressure) and coming into this season we all knew we had a lot of hard work to do. I think if we continue to work hard we will be right there with some of those past teams in the coming years. TM: Whats your favorite class? JG: Accelerated US History 1 with Mr Miller. It's my hardest class, but its also my favorite. TM: Do you have any pre-race superstition? JG: Before dual meets when we do our warm up we never go through the chute at the finish line. TM: How did that come about? Was it passed down from previous teams? JG: I am not sure, but Greg Halla (captain) told us at the beginning of the season that we could never do it. TM: Do you have any personal superstition? JG: I have two pair of trainers. A light pair and a heavy pair. On meet days I warm up in my heavy trainers. TM: Special pre race meal or food? JG: I like to eat Italian before races. TM: If I stole your I-Pod what would I be listening to? JG: Most likely Rap & Bruce Springsteen. I like to listen to Jungleland by Bruce Springsteen before races. TM: If you weren't running for the bulldawgs this fall what would you be doing? TM: How did you get interested in running? Did you run on Mrs. Baker middle school xc team? JG: Yes, but I would only show up once every two weeks. I'd played soccer for Mr. Earhardt and he would tell me, "you two look pretty quick". I went out for middle school track and ran the half mile and I liked it. Erin Donahue was my coach and told my parents that I would be good at running and that I should go out for cross in the fall. TM: This time last year your season was over. As you head into the championship part of the season do you have any team &/or personal goals? JG: Team wise we would like to get on the stage @ MOC & personally I would like to break 17 minutes at Holmdel. TM: Your mile pr is 4:56, you went out last week in 5:02. What was going through your mind when you heard your mile time & it was only 6 seconds slower than your open mile pr? Did you panic? JG: Coach Baker said it was going to go out hard & I knew it would. I went out with Patrick Shea who has done a good job of pacing me all season. He knows what he is doing and I trust him. TM: Were you surprised by how well you ran last week at the All Star meet? JG: Yes. At camp this summer one of my goals that I wrote down was to break 16:45 at Pennypacker. I knew I was capable of doing that. The summer training and hard work carried me through to my pr of 16:15. Look for my sectional preview next week. Lastly, I wanted to thank everyone for reading my blog. This week my blog registered its 1,000 visitor. I wonder how many Courier Post subscriptions that would equal if they still covered XC? I waited a few days to post this recap, because, quite frankly, it has taken me that long for the results to sink in. Last Thursday on Senior Day, senior Miles Devine stunned the standing room only crowd by running the fourth fastest time EVER at Penny Packer park!! His 15:34 is a whopping 1:26 improvement. To try and put into perspective, he ran faster than Matt Nussbaum, who was a 4 time HS All-American and the owner of a 4:15 mile pr. His time at Pennypacker is faster than Colin Baker, who blazed a school record 4:09 mile. Mike Burke, who in 2006 has the 14th fastest time, has a mile pr of 4:17. Lastly, Miles owns Tim Malloy, who has the fading 16th fastest time. Tim went on to break an 18 yr old record in the 3200 that same spring at the Camden County track meet while running 9:18. Greg Halla ran extremely fast as well. His 15:35 is 6th all time and Greg is only a junior. Greg ran a pr by over 30 seconds. The other Dawgs that raced out of the minds & flats were Sophmore Patrick Shea who cracked the top 30 by running 16:07 for 23rd place all time. Sophmore, John Greenberg who owns a mile pr that is measured by a sun dial ran 16:15 that is only a 2:39 improvement from last year. Alex Gigliotti another super soph, ran a pr as well and his 16:29 would have cracked the top 30 from last year. Junior Robert Spaeth & Freshman Danny Brennan rounded out the top 25. Next up is the 15th annual Haddonfield Invitational on Wednesday @ Pennypacker park. What to look for in the coming weeks? A Q&A with some current dawgs. Also a Sectional preview. Until than. The lady Dawgs finished the regular season undeafeated. They capture the Colonial Conference title for the 12th straight year. The All Star meet is a chance for the girls to see how fast they can run on the home course..
﻿﻿ Look for Meghan Malloy & Shelby Cain to try and crack "18" minutes which has only happened once in the histrory of this meet. Haddon Twp's Alicia Pipkin , Haddon Heights Dani Hornef & West Deptford's Millie Kipp should round out the top five. The remaining five spots should be Junior Sophie Martin, Sophmore Molly Bollinger, Junior Kara Rosengard, Senior Taylor Fenton & Freshman Lauren Decoursey. All from HMHS. No team scoring just all conference honors at stake. ****Erin Donahue & Vanessa Wright never raced on the current course. No times are available for them, but chances are they would have gone sub 18 minutes on the new Pennypacker course.